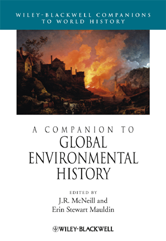 The Companion to Global Environmental History offers multiple points of entry into the history and historiography of this dynamic and fast-growing field, to provide an essential road map to past developments, current controversies, and future developments for specialists and newcomers alike. Combines temporal, geographic, thematic and contextual approaches from prehistory to the present day. Explores environmental thought and action around the world, to give readers a cultural, intellectual and political context for engagement with the environment in modern times. Brings together environmental historians from around the world, including scholars from South Africa, Brazil, Germany, and China.